Yesterday’s single-day Greninja Saga Super Smash Bros. For Wii U tournament ran late, leaving one pro in a predicament after qualifying for the finals. Elliot Bastien “Ally” Carroza-Oyarce was leaving on a jet plane at 11:45 p.m., and the tournament kept going later and later. Ally had scheduled his flight in advance, as any savvy traveler might, but was so confident in 2GG’s management of tournaments that he bought an 11:45 p.m. flight, two hours and change after Greninja Saga was expected to end. That hubris would soon lead to tension, as the day’s matches kept dragging on. 9 p.m. rolled around and the top eight was barely underway. Ally, playing on the winner’s side of the bracket, seemed determined to end his sets in quick fashion. He dropped only a single game on his way to the grand finals to 2GG’s Rei “komorikiri” Furukawa, sweeping all other opponents. Other pros and the audience were enjoying the ride, laughing at sets that go the full count because they were prolonging the tournament even further. Finally the grand finals came about, and Ally was on the clock with an hour and a half to win. Even Twitch chat was getting in on it, cheering Ally on to make his plane. 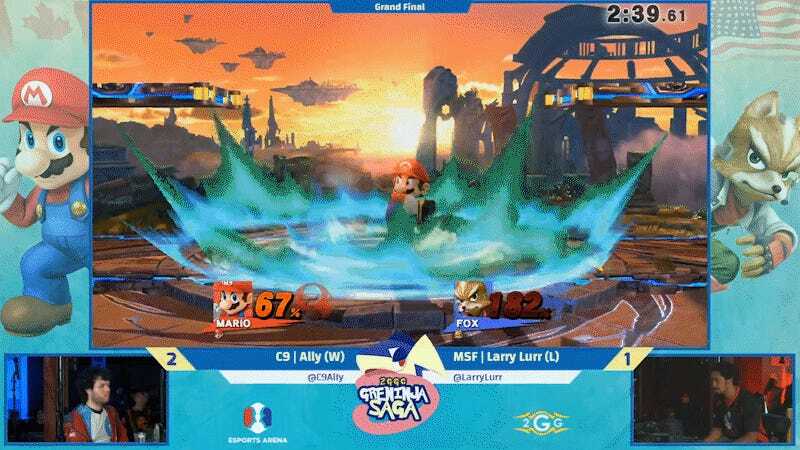 In response, Ally delivered against “Larry Lurr” Holland, beating the Fox player in a 3-1 set and winning the tournament. Ally’s win at Greninja Saga secured him a spot in the 2GG Championship at the end of the year, as well $4250 in earnings for this Saga. “Did not finish before 9 p.m., but I think I can still make it,” said Ally. And the big question: did he make the flight? Greninja Saga was an overall spectacular tournament with plenty of great storylines, from one of the best players in the world ZeRo not making the top eight, to Very Good Boy and free agent Locus taking out pros like Abadango. But the true moral was this: don’t schedule your flights so early for a one-day tournament, Ally. Smash 4&apos;s Competitive Scene Is Thriving, But Can It Take The Next Big Step?